Luke Ski's episode "Gotta Get Grup To Get Down" airs today on Cartoon Network's "Mighty MagiSwords"! Today on Cartoon Network, the final actual for reals-cartoon episode based on that original hand-drawn-on-paper storyboard, titled "Gotta Get Grup To Get Down", airs on television. The outline was written based on my original work by Kyle and Richard Pursel, and was storyboarded by Zoë Moss doing the first half, and myself doing the second half. (The point at which Witch Way arrives is where my half starts.) Richard and Zoe added an opening act to the story because my version's was much too short. 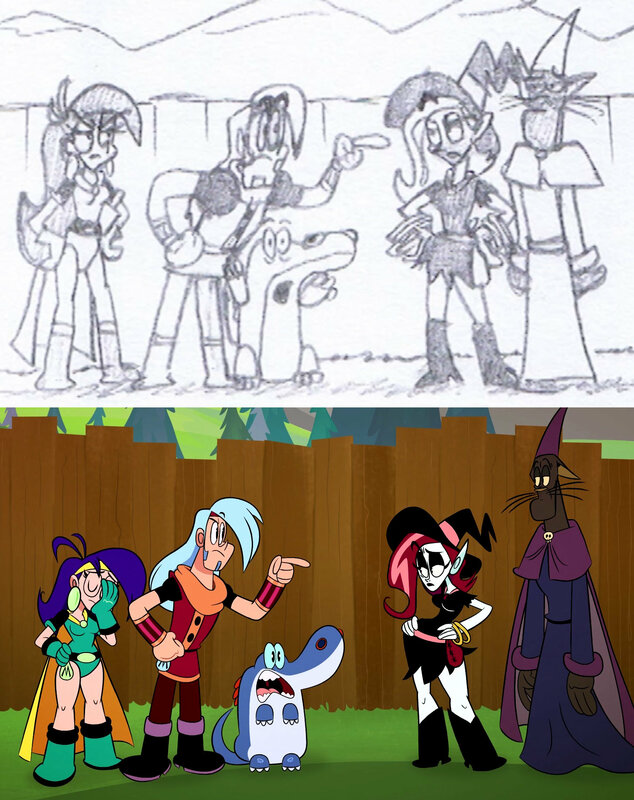 Part of the point of this story was try to work in as many of the show's regular recurring characters in the story as possible, making it a treasure trove of fun for all the fans who have been following along during the whole run of every version of "Mighty MagiSwords" released thus far. So keep your ears open for the voices of myself, Kyle, Grey Griffin, Eric Bauza, Mary Faber, Arin Hanson, Lindsay Smith, Doug Lawrence, Candyce Milo, and Phil Lamaar. I hope you'll all join me in watching this show today, or DVRing it or watching it in some other soon-to-be-available digital capacity soon after it airs. Today is a day of joy for me, because, in the terms of 'Luke creates something consumed by the masses', this is the greatest creative achievement of my entire life. I am confident there will be more similar things to come in my future, but this particular thing is special. For me, this is the shot heard 'round the world that, yes, Luke Ski can and will do stuff like this. This is the culmination of a dream of mine that started in grade school. It got sidetracked for 20 years while I was becoming a big fish in the much-smaller-than-it-deserves-to-be pond of comedy music fandom, but when the opportunity presented itself to become a part of a animated comedy show for television, I went for it and I succeeded. And this episode of "Mighty Magiswords" is my golden shiny symbol of that success. So, this ain't no ordinary 'Here goes Luke talking about how frakking great he is yakety shmakety bla bla bla'. This is something I've waited my whole life for. Today is a happy day. I hope you all will join me in that happiness. Thanks so much to everyone I already mentioned in this message, to Keith Fay, Rebecca Himot, Tramm Wigzell, Ken Mitchroney and everyone on the staff who has been there for me and believes in me. Thanks so much to my friends and my family who have been so supportive during the past 2 years, know that I love you all more than I can possibly express. The Warrior family motto is "In the name of the Warrior, no matter what happens, don't blow it." I can confidently say that this time, I didn't blow it. So in conclusion, I will leave you with the wise words of Grup, "Yaaay!"